Vignette depicts, down, two submarines surfaced and, at the top, the detail of a tower. 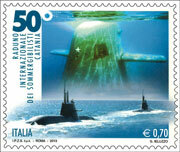 Completing the stamp the legend "50th INTERNATIONAL MEETING OF CATANIA submariners", the word "ITALY" and value "€ 0.70". Adhesive acrylic type water, distributed in amounts of 20 g / m (dry). Sheet: twenty-eight specimens, the value "€ 19.60". DO NOT HESITATE TO VISIT THE WEBSITE AND ME SAYING THAT SEEM. IF RECORDED MAY DOWNLOAD ALBUM CATALOG AND LEAVES.